1.Asos/ 2.Asos/ 3.Eleven.se/ 4.H&M/ 5.D&G/ 6. Topshop/ 7. Net-a-porter.com/ 8.Accessorice/ 9.Oasis/ 10.Luisaviaroma.com/ 11.Nelly.com/ 12. Topshop. I was thinking of doing a collage like this for a long time and then I found this. But I can't remember where...These sweet pastel colors are almost in all programs, from head to toe. The king? this mint color. Got youself a favorite? I'll receive the spring with open arms. Mint Mint Mint!!! Im in love!! Good selection Zoé, thank you! 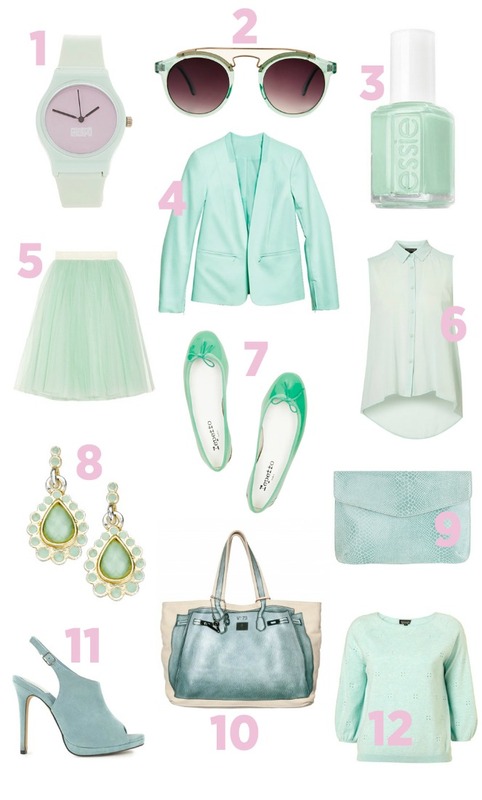 I want Mint this spring-summer! I love the skirt and shirt! Sure you have to try it! Esstou mortinha por encontrar uma peça com essa cor! I totally agree with you ! I love mint color ! I have been in love with mint lately! That skirt is officially on my wishlist. hello! I saw your comment on my blog, sorry for my late reply! of course I'd love to follow each other! just follow me and I'll follow back you within 24 hours :) should we follow each other on bloglovin too? let me know! have a nice day! Love this post, sweet! I'm all mint this year! yo tambien estoy loca con este color!!! un besito enormee!!! Mint green is my favourite colour!! Love it all, great finds.thank you for the comment you left on my blog, sorry it has taken me o long to get back to you! Have a great day and please visit again. Yes of course we follow each other, I really loved your blog! hi thanks for the comment! sure i'm following you, please folllow me!! tia ese color d uñas donde lo hayy????? ?